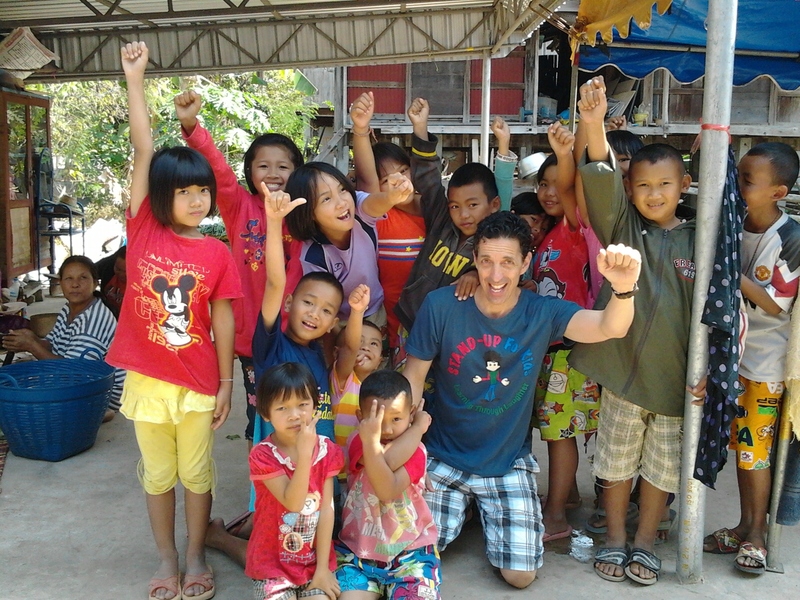 Stand-Up For Kids Visits a Village in Northeast Thailand! Thais also love to laugh and get silly. Of course, this is perfectly suited for my personality because my mission in life is to bring laughter and smiles to everyone. After my first trip to Thailand about five years ago, I decided to teach myself to speak Thai so that I could communicate with the locals on subsequent trips, not to mention that I really enjoy learning another language and I thought that it would be fascinating to take up the challenge of learning something with which previously I was completely unfamiliar. So my language prowess has allowed me to perform in Thailand on many occasions. I’m quite skilled in speaking Thai, and although I am not fluent, I can certainly hold my own. While Central Thai is taught in schools nationwide, about one third of the country’s population lives in the region referred to as Isaan; Generally speaking, Isaan is farmland, rice fields, etc. and the people there live in villages that seem like a trip back in time or something inside of a National Geographic magazine. People in Isaan also speak the Isaan language, which is extremely similar to Laos, the language of the neighboring country, Laos. Needless to say, last weekend when I was cordially invited to visit my friend Keng’s village in Mahasarakham Province in Thailand, I knew that I had my work cut out for me because the village residents normally speak Isaan; While they also speak Thai, I knew that the slang, colloquial language, and idiomatic expressions in Thai that I’m still not familiar with would make things a little more difficult to communicate. From the moment we arrived at the market at 5 a.m. on Saturday morning, the Isaan people stared at me in amazement because it is very unusual to see an American, or any other “farang” (the term that Thai people use to refer to foreigners) at the market, especially at the crack of dawn. But once I started speaking Thai with the people, it became instantly evident that laughter is universal in any language. Keng and some of her family members and I paced up and down the market aisles, talking and laughing with the vendors and buying insane amounts of exotic Thai fruits, vegetables, fish, and other locally grown products. Soon after I broke into some improvisational English games that included my usual silly antics, the children were fully engaged and asking for more. The intoxicating sound of their innocent laughter fueled me to continue uninterrupted for nearly two hours, until it was time to eat. Following a wonderful meal, I helped several ladies wash dishes in the plastic containers that were situated in the grass near the dining area. I asked the children if they could help transport the dozens upon dozens of dishes to the storage area and they were more than willing to help. Little did they know that once we finished, I would offer to buy them the ice cream of their store at a family owned village “shop” down the main dirt road. As I teach in my show, one must do good things and demonstrate solid character in order to live a fulfilling life. If only you could have seen the caravan of children following me to that shop in anticipation of a delicious dessert that served as a reward for their good deeds. It was truly a priceless scene! The adults in the village were truly appreciative that I spent most of my time entertaining the children; At one point, during a ceremony that was taking place in the house, the children and I walked through the village to the nearby Buddhist temple, where they took me inside and paid their respects to the giant Buddha statue. The fifteen or twenty kids clung to me as if they were laying claim to their prized possession who had magically appeared in their village that day. We stopped at house after house and I would continue with my antics, much to the delight of the lovely children AND the unsuspecting villagers who were more than happy to see me drop by just to say hello and exchange pleasantries. As the weekend went on, I was continuously reminded of how lucky I am to have a special gift to bring laughter to people everywhere I go. It doesn’t matter where you are, what language you are speaking, whether people are rich or poor, white, black, or any other color for that matter, laughter is truly universal. 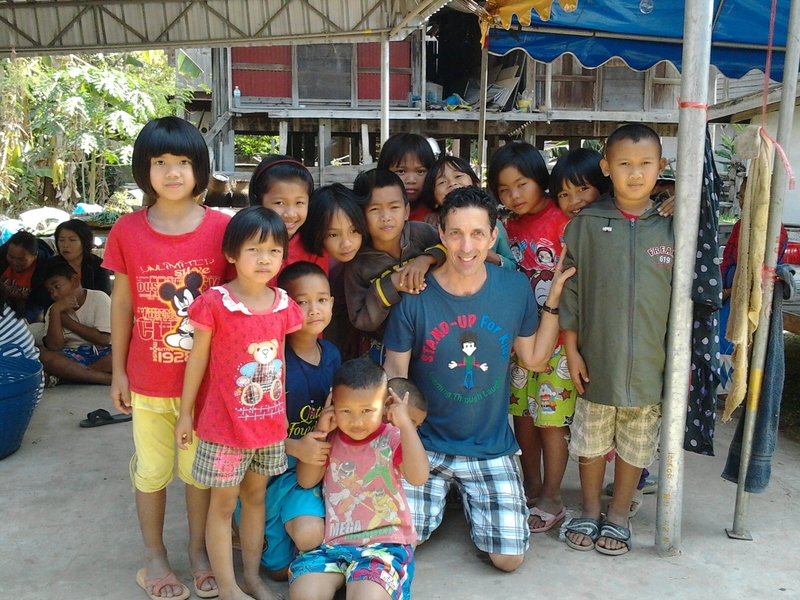 The poor children of the village that I visited last weekend were begging me to come back at my earliest opportunity. In fact, it was so cute when one little girl asked me if I wanted to marry her older sister and teach English at the local elementary school! I respectfully declined the marriage offer, but I promised the children that I would return again. On Sunday night, as Keng and her two nieces and I were packing the car with our belongings, the children and adults took their turns hugging me and sending all of us on our way back to Bangkok (a six hour drive). As I got into the car, I heard one of the little children say, “We love him.” The truth is that I love them too:) Stand-Up For Kids rolls on……. Improvisational Stand-Up Routine Dazzles the Audience! Enjoy the performances and thank you for your love and support as I continue my quest to take this show to the masses! Hey, I Remember Him……….This Guy is Hysterical! So Stand-Up For Kids performed at five South Florida schools this week (Egret Lake Elem., Stephen Foster, Coconut Creek, Pembroke Pines Charter Central Campus, and Belvedere Elem.) as part of the 21 schools tour for October and November. What an amazing week of terrific shows, smiling faces, and great memories as I continued to visit schools that have never seen the show, one in which a former bully acknowledged that he was changing his ways, and a campus where a little boy stood frozen as he saw me enter the cafeteria in advance of setting up for the day’s special event. No matter how many times I show up at a school where I’ve never performed, it never ceases to amaze me how curious the children are to know what they are about to see and who I am. It’s just so funny to hear their questions as I am hauling my sound equipment and things into the cafeteria. “Are you a magician? Do you like pizza? Why do you have such curly hair?” hahaha……..I always have such great banter with these kids, partly because it’s my nature to never pass up an opportunity to inject my silliness into a conversation with a child and also because it’s just so much fun to hear brutal honesty from children. But the comment from this week’s shows that still sticks out in my mind came from a boy named Caleb. After asking the audience for a volunteer, I randomly chose him from the audience. He definitely held his own in the wake up of the comedy frenzy that I directed his way, everything from improvised comments (honed and perfected from years of stand-up in clubs, colleges, theaters and every type of venue imaginable) to kid-like gestures and movements that I employ to raise the hysteria, all the while weaving my life skills concepts in and out of the insanity. Caleb had such a great time joining me onstage that after the show, he made sure to be the first one in line for an autograph, as well as to suggest that I should come to perform at his church! As I was loading my sound equipment and things onto a cart at Indian Trace Elem., I noticed scores of children coming into the cafeteria so I pulled the cart to the side because I didn’t want to get in their way. No sooner than I looked up, kids came running up to me saying, “I remember you. You’re that funny guy. We love you. Are you doing a show today?” (Well, honestly, I don’t mean to toot my own horn so to speak, but this is a regular occurrence any time I visit a school for a repeat performance. Nonetheless, it is heartwarming and special:) I replied, “Yes, I’m performing today.” And the cheering began amongst them……………..
“All of the kids love you.” “This is going to be the best day ever” As the great comedian Bill Cosby said, “Kids say the darndest things.” Boy, was he right. If I were to compile a list of statements that I hear on a daily basis, it would surely turn into a national best seller. But it is the moment and context in which the child says something like this that makes it truly special. I hadn’t even performed my show yet I seemingly had 160 admirers who were ready to watch, listen, and learn (and laugh a lot) to everything that I was about to say and do. Needless to say, once I set up my backdrop, sound equipment and props and turned on some pre-show music, children were chanting, “We want Pedro, we want Pedro!” I could only smile and laugh at how wonderful it was that they were demanding to see my show puppet, Pedro. Stand-Up For Kids Fall South Florida Tour in Full Swing! They are laughing and learning. I am truly grateful to be able to do what I do. I started performing stand-up comedy at a very young age, when I entertained scores of kids in the old neighborhood. That eventually led me to do the morning announcements at Driftwood Middle School in my hometown of Hollywood, Florida. I have very fond memories of recording the school sports news with impersonations of Muhammad Ali, Howard Cosell, Jimmy Carter, and a host of other well-known people. As far as I know (and I have researched this many times online), I am the only true professional comedian in America who performs separate shows for adults (www.pureinsanity.com) and children. My dear friend Dr. Janet Dobry, who is the Principal of Robert Taylor Elem. (where I’ve performed many times) in Henderson, Nevada, once said to me following one of my shows, “There is no greater sound than to hear the laughter of children.” Luckily for me, I hear that laughter from hundreds of children on an almost daily basis. So, as I look forward to my next performance at Indian Trace Elem. in Weston, Florida, I say thanks to the many children, teachers, PTAs, administrators, and aftercare directors who cordially invite me to perform in their schools time and time again. The tour rolls on so look for Stand-Up For Kids in your town…………There’s only one “Mr. L.” Bye for now…………..
Book Stand-Up For Kids today! A unique and hilarious interactive assembly show that teaches elementary school children about life skills, character, loving life, humor and being a “STAR” Student through the art of Stand-Up comedy.